Was Caniron at Calgary or was it Calcoolary? There are some things we can control, but thank heaven we can’t control the weather. The prairies are known for their warm summers, so why should we worry about the probability of rain, let alone the thought of snow warnings and road closures? The displays were inside the halls of the South Alberta Institute of Technology (S.A.I.T.) and the demonstrations were set up outside in five large tents, so the weather really didn’t bother the show. Weather aside, CANIRON II was an excellent event. Hats off to all the people and businesses that helped in its creation and implementation. The dorms were available for the people who flew in, the RV lot held all the people who drove to the event, and the hotels took care of all the others from out of town, such as Francis Whitaker and company. The cook/chef preparation class provided the multitudes with three square meals a day for the event. The swimming pool and showers were open for all to use. The maintenance people from S.A.I.T. took care of all the mobility problems, by using their equipment and electrical services. 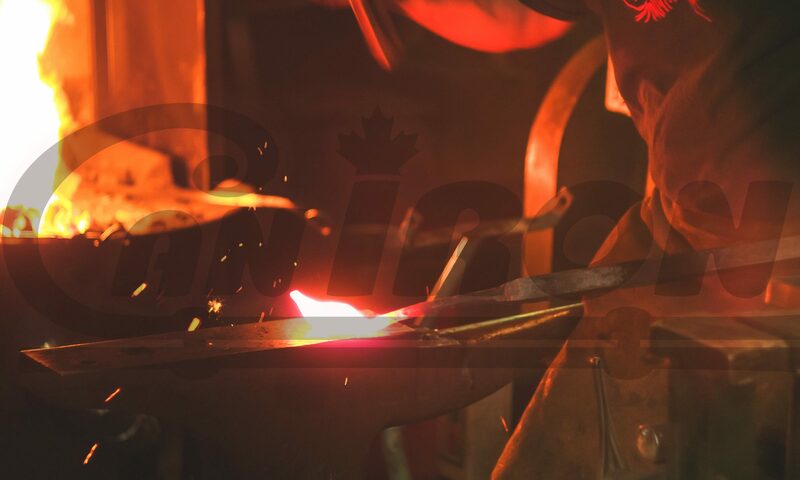 Some of the steel supplies were held up getting there on time, so alternatives were created and demonstrators did what they could with what was available, and a few things were borrowed from the Vancouver Island Blacksmiths Association’s Flyin’ Forge. I brought my 50kg. Kuhn air hammer with its concrete bases and set it up in one of the tents next to the electrical distribution center. Bill Plante brought his 583-lb. homemade anvil and parked it near the entrance of the Campus Center, like a giant doorstop. Bill Pieh and his wife brought their library and some pieces from Centaur Forge. Norm Larson and his wife were there with their bookshop. Sid Suedmeier and his wife brought a couple of their 25-lb. Little Giants as well as tables full of the Little Giant parts. Richard Sheppard brought three of his Big Lick treadle hammers and one was used for the draw held on Sunday night. Thursday was a busy day, with people setting up last minute things everywhere; setups being tried, people meeting people, people watching people working, people registering, people arriving, people asking where things were and people checking the sky. At the end of the day, ready or not, the time had come! When things got going on Friday morning, a new demonstration schedule was used. Doug Newell had taken a fall at work and hurt his shoulder, so he had to cancel as a demonstrator. Doug had won the world championship, open class blacksmith competition, at the Calgary Stampede in 1998 and he won it again this year. Bill Fiorini started with the basics of pattern welding for blades and continued on over the weekend to make several patterned billets. He explained his simple system of forge welding using a touch stick of 1/4″ square. He kept the touch stick next to his billet, so when it stuck to the outside of the billet, it showed it was now time to strike the billet so it would stick together. His first weld was always by hand hammer, the second and third weld were by power hammer. Bill’s wife, Kirsten Skiles, was demonstrating her technique of repousse with steel plates. Mark Pearce was demonstrating layout all the way to finished product of complex scrolls, integrating one to another and maintaining proper perspective. Susan Hutchinson started with a slide show and a discussion about good design, doing the layout on a piece of sheet metal, followed by the creation of the drawing. She didn’t let the complexity of the project slow her down, she just got on with it. She forge-welded corners to gain mass, joining the two corners together to create a very bold 90-degree corner, followed by drawing the remainder of the material, twisting and curling it into a very unique music stand. Uri Hofi and his striker Amit started into their show as a team on the anvil and as a team working the power hammer to its max. From a distance, the Kuhn hammer sounded like a steam locomotive with a full pull on a steep grade when Uri was giving it a workout. Charles Lewton-Brain was demonstrating his fold-forming techniques. He was twisting, quenching, pulling, quenching, spiraling, quenching, bending and quenching with copper, brass and steel sheet metal. This is a system he says he invented and the creative effects let your mind visualize all kinds of very interesting patterns and shapes. Charlie Sutton was demonstrating Fundamental and Essential Blacksmithing Skills, which sounded very basic at first, but it wasn’t. There were all kinds of stories explaining the “whys” and the “why nots” of dealing with different layouts. Charlie has written a very good book, “Under the Spreading Chestnut Tree,” a definite plus for anyone’s personal library. Bill Plante was demonstrating all kinds of interesting little projects. The theme was “Using Whatever is Available to Make Whatever You Want or How to Make Something Out of Nothing.” Bill doesn’t let the thought of “can’t do it or it can’t be done” get in his way. Whatever his mind says to do, he just builds, like the 58-lb. anvil he welded together. Frank Turley demonstrated, in his own unique style, how to work with 1095, S-1 and S-7. If you weren’t awake at the start of his sessions, you definitely were in a few minutes. While working with S-7, Frank said, “Tool steel laughs at you when you make mistakes; mild steel just takes it and smiles.” He also advised to pre-heat tool steel before putting it in the heat, as this prevents thermal shock. He likes to use the phrase S.O.R. (square, octagonal, round): this is the method of drawing out anything to a round. On Friday night there were demonstrations open to the public. Rob Valentine was demonstrating how to make armor. (see page 30). Richard Sheppard was demonstrating his Big Lick treadle hammer. Ceyse Harse was demonstrating her basket and bowl techniques, Brian Lyttle was demonstrating metal engraving on knife blades and other objects. Al Bakke was demonstrated how to forge weld and draw out a ten-layer billet for pattern welding. His method was using the quiet power hammer, an electric hydraulic press. There was no banging and hitting, just the creaking and groaning of the hydraulic press frame. He says that if you think it can’t be done, try it anyway – no miracles, no fuss, minimal noise – like it just grows that way. The Gallery in the Alberta College of Art and Design was always open for anyone to visit. It was a room full of great creations that were brought for “Show and Tell.” Chairs, a garden arbor, a full suit of armor, a lady’s metal corset, lamps, knives, bowls, flowers and lots more. A photograph doesn’t do these articles justice; they were magnificent. Saturday was a continuation of Friday, with so much to see all at the same time and so little time to try to take it all in. Francis Whitaker was busy talking to whomever came and sat down at his table in the commercial display room. He was proud to say he will be 93 shortly. He had his scrapbook full of pictures of many of his different projects and he answered questions as to how the projects were done. There were a few questions that he answered by suggesting the individual forward the question to the Francis Whitaker Foundation, to see if they could help. Saturday evening there was an auction of donated items that individuals had brought along, and also those items that were created during the demos. It took about four hours to complete and when the calculators stopped, they read in excess of $12,000. Francis Whitaker even asked that his taxi fare back to the hotel be auctioned for, and he donated the $40.00 to the kitty! Sunday came too early. Where does the time go when you are having fun? Everyone present had waited a long time for this event, and now it was almost over. The demonstrators were busily trying to finish their projects. Many friendships were made, e- mail addresses exchanged and ideas were budding. There was “cranium overload,” pens running out of ink, and camera batteries wearing out. The last event was the barbecue at the Campus Center on Sunday night. It was a pleasant way to wrap up an exciting weekend with lots of chatting, laughing and meeting still more people. A very big thank you to Rob Sadowski, Bob McRae, the volunteers, the Western Canadian Blacksmith Guild, and S.A.I.T. You all did a fantastic job and we look forward to Caniron III in 2001!